Just have to catch you up on a few different things. First of all, our plans for the summer of 2014. As our regular readers know, we managed a campground in the middle of Saskatchewan, Canada last summer. This coming summer season, we are doing the same thing. But at a different campground. We thought that we would have been going back to the same place. But back near the beginning of December when we offered them a commitment, they said they were not in a position to make a decision until mid February. We said that we had to look out for our own best interests, and therefore would be keeping our eyes open for other opportunities in the meantime. Well another opportunity did in fact came along, and we accepted an offer to manage Cabri Regional Park, about 45 minutes NW of Swift Current, Saskatchewan. Location of Cabri Regional Park. So, we are signed up for a five month contract from May 1st until September 30th. Of course all of our RV'ing readers are going to mark us into their summer travel plans, so we're expecting lots of visitors. We're also going to head back to Ottawa for mid April and spend about a week there before driving the little blue car out to Saskatchewan. So, that's exciting, isn't it?? Okay, on to something else. And this next one is the local band, playing entirely with homemade instruments. Proof that if you want to make music, it doesn't take money! These guys were fantastic and we enjoyed watching them! That was fun, wasn't it? Kinda makes you wonder why you've never been to visit Lesotho. Okay, on to yesterday. We didn't really do very much except get caught up on some internet research regarding our onward travels, but we did go visit a local hotel we had been told about. In the town of Bethulie, right at the main intersection is an old hotel. It is really nondescript from the outside, and if you were driving by you wouldn't even know that it is a hotel. But if you have the owners phone number (and we did!) you can "BOOK" yourself a room. And the keyword here is "book"! All available wall space is lined with thousands of books. Ruth, in the reading room. The bar. More books are available here, should you need one. And if books aren't enough? You can listen to records. Yes, the old vinyl ones. You can choose from about 80,000 albums. Now that is a very interesting Library and record collection. we love places with a twist and this one sure fit the bill and the owner Tony was also a very interesting and knowledgeable man to talk too. Looks like you could curl up here for a lot of hours. You most certainly could and there were a lot of comfy seats scattered throughout the hotel to do that in. Does this mean that you leaving the RV in Mexico once again this summer? Looking that way, but still up in the air. In what language are the books? Mostly English from what we could see. Wow. Look at that place. I think I could spend hours. Congratulations on the summer job. Should be fun. Thanks Bob, we are looking forward to this new location. So from March to April you are going to be in Mexico and then fly back to Ottawa and drive from there to Sask? 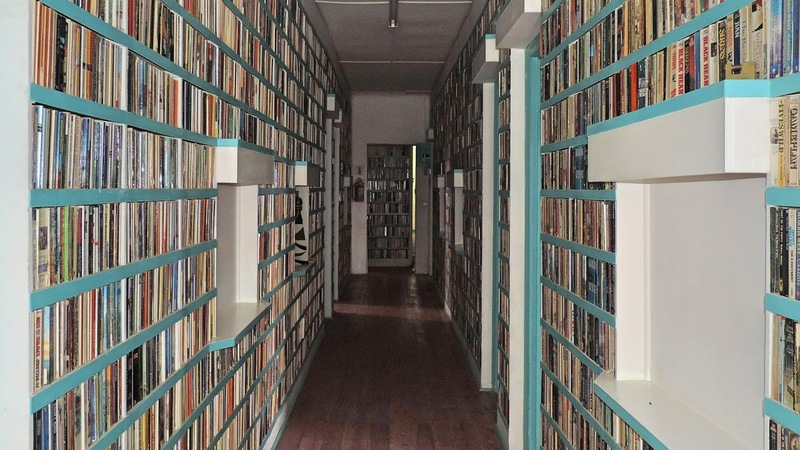 Great "book" place, lots of books and records for sure! Not far from us, so you know you have a place as you go by, Hope you will stay with us again. Our plans are Alaska this summer if all goes well. Thanks Wendy, we will keep that in mind. Sounds like you will have a great summer, hope that you will take some time to stop by and visit us a the campground as well. Nice that your summer plans have fallen into place. That campground should be counting its lucky stars you're coming to run it! Hopefully, we will show them that they made the right choice. So, just to understand...Is Sherman staying in Ottawa? Plans sound great - you know you will see us there about 1st or 2nd week of June! We haven't quite figured that out yet, we may leave him in Mexico ONE more summer or we may drive him out and leave him somewhere in the USA and then fly back to Ottawa from there. We have been checking for cheap flights, so who knows what we will do but we'll let everyone know once we know. Is the job description pretty much the same as last year. I hope you have a few more minutes a day for relaxation. I'll look forward to theses adventures as well as the ones you're sharing now. Wow, I could really stay in the hotel a looong time! It is very similar but we will also have to look after the office with bookings and collecting fees. We will also have 2 full time helpers. Hope you make it up to Canada this summer so that you can visit us. What is the location and name of the Camp Ground you are Hosting. We live in Medicine Hat and would like to drop in for a visit. Guess you missed it in the post but as Kevin mentioned it is Cabri Regional Park outside of Swift Current. Look forward to meeting you this summer. I love the old tin ceilings! and the books. Even though I lived in South Africa for 25 years (and Rhodesia (Zimbabwe) for 17 years, you are teaching me stuff about things I never saw. Fantastic travels. No matter where you live there are always new places and things you learn about in your own country. Hi, just come across your blog, very interesting. We're a middle aged couple and spent last year traveling through Europe and spent the winter season working in a ski resort. How do you find jobs further afield and are work permits etc an issue? We have never worked outside of Canada so have never had to worry about work permits. We have in the past worked in Ontario for 2 summers and 1 winter and last summer and this coming summer we worked/will be working at a campground in Saskatchewan, Canada.